Unable to provide form due to insecure browser. Your browser is unable to connect to the payment gateway. The gateway could be down (try again later), or, it could mean that your web browser does not comply with our security standards. For the safety and security of our customers credit card information Incredible Technologies, Inc. adheres to the standards of the Cardholder Information Security Program (CISP). You can still perform all other transactions on this website, but we are unable to proceed with any transaction that requires a credit card at this time. Give the gift of game! 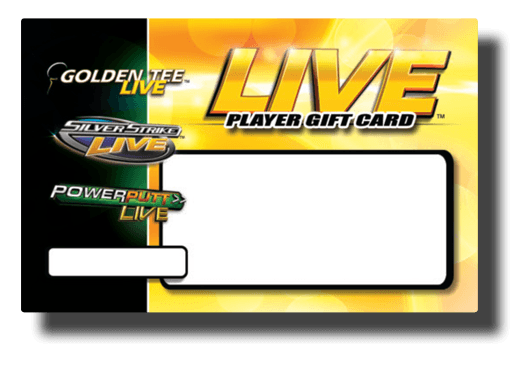 LIVE Player Gift Cards are available for purchase, and can be used to pay for games on all commercial Golden Tee LIVE, PowerPutt LIVE and Silver Strike LIVE machines. Customize these cards with a personalized message and pick the amount you’d like to purchase. The perfect gift for any trackball fan! Please note: gift cards can be redeemed for payment of games and equipment at the machine only and are not redeemable on the LIVEWIRE website or GT Caddy app. For amounts larger than $250.00, please contact Customer Service at 800-262-0323. Note: Dollar amount does not appear on card. If you wish to display a dollar amount please add it to your personalized message.